Here’s a summer soup that’s cool as a cucumber, with a little spice for heat and lots of fresh herbs. I chose parsley, cilantro and dill, but variations are endless. Try it with mint or basil, or both. You can add more spice by mincing in a chili, or flavor the soup with a finely chopped spring onion (green onion) on top. For another variation, add some curry powder — the soup will turn a bright yellow-green. Serve it cold as a first course, and if you have lots of people at your table, double or triple the recipe. There will be calls for seconds. Beyond its value as a delightful and healthy start to a meal, this soup has the advantage of being very quick to make — 5-10 minutes, depending on how quickly you chop. And, as I discovered when there was a little left over, the soup may be used as a sauce! Think of it as a green sauce to be spooned, for example, over cold roast lamb, roast chicken, poached salmon or asparagus. Far lighter than hollandaise or mayo, it will add a nice accent to your summer dishes as the hot weather kicks in. Site news: The print button is fixed now, and I hope I can dare to say that the technical problems that cropped up during the hacking of this site are now all cleared up. Happy cooking! This entry was posted in 2. 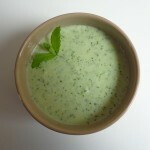 Soups and tagged cilantro, cold, cucumber soup, dill, parsley, recipe, soupe de concombre, yogurt. Bookmark the permalink. I love that “cleanprint” function. Never saw it before — what took people so long? Don’t we all hate printing useless pages? 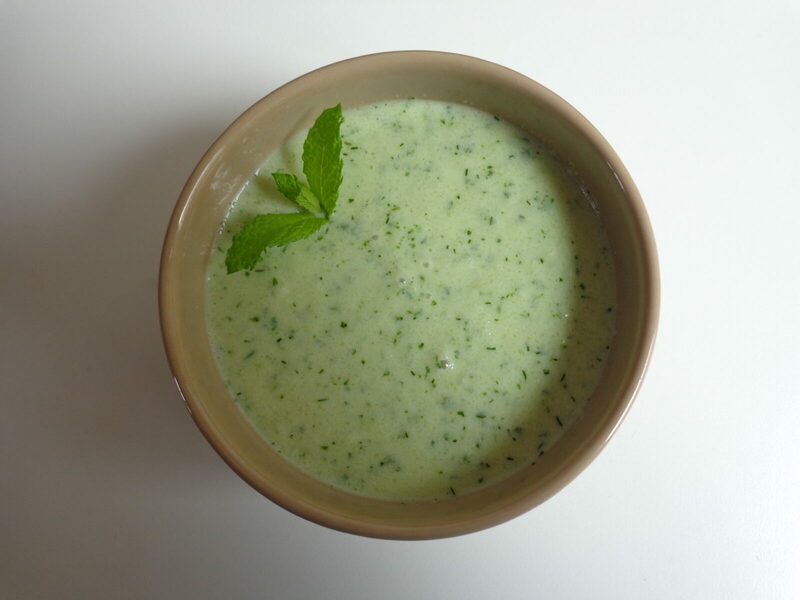 And yes, I obviously just printed out the recipe for cucumber soup — can’t wait to try it! Thanks, Meg!